Massachusetts Sen. Elizabeth Warren has made a name for herself on Capitol Hill battling Wall Street, and much of her time with Stephen Colbert on The Late Show Wednesday was dedicated to the same rhetoric she's been pushing for years. But things were a little different this time around. She was fired up, she was passionate, and she sounded just like a vice president. Now, I'm not reducing Warren to veep status because I don't think she has what it takes to go for the top spot. 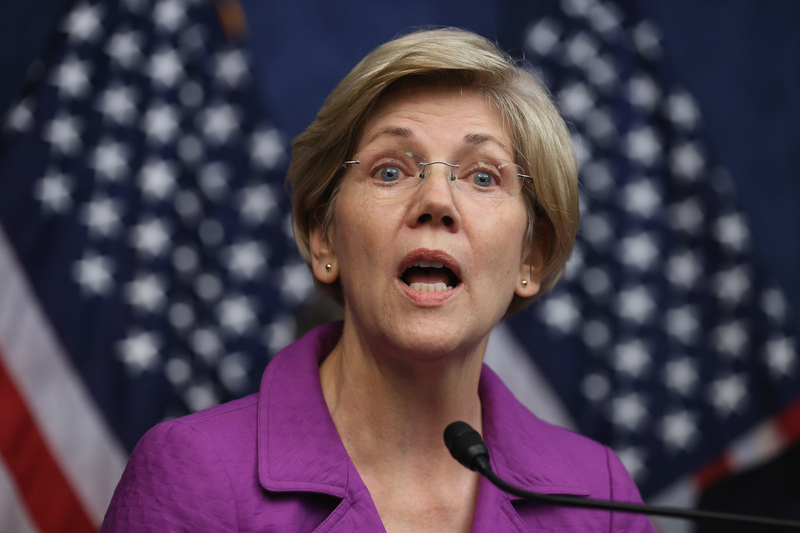 Warren has reiterated time and time again that she is not running for president in 2016. But man, during her sit-down, she sure did sound like a candidate on the campaign trail. Warren was up in arms as she blasted our economic policies since the 1980s, which she argued gave the top 10 percent of Americans 100 percent of the country's income growth. Here we are the richest country on earth. We have so much going on for us and yet we have a federal government that works great for millionaires, it works great for billionaires, it works great for giant corporations, for anybody who can hire an army of lobbyists, an army of lawyers, give lots of campaign money. For the rest of America, it's just not working and it's time we take that government back and make it work for us. And the audience loved it, erupting in applause at every staccato dig against Wall Street. "Well, you don't sound like you're running for president, I'll tell you that," Colbert joked, with a hint of a smile on his face. Nope, Warren sounds like she'd be a great running mate for the eventual Democratic presidential nominee, whoever that might be. There's been talk about Sanders, who shares much of the same ideologies, and also Biden, should he decide to actually run. But the person to benefit most from Warren is Hillary Clinton since the Massachusetts senator would be positioned to rally progressive Democrats as well as woo independent voters angry about income inequality. A full female ticket is also an attractive opportunity to make history in more ways than one. The in-studio audience loved every bit of what Warren said, and I have a feeling the sentiment is shared across America. She might not be running for president, but that doesn't mean she isn't angling for a VP spot. And even if she has absolutely no White House ambitions this time around, it's not so crazy to already be thinking about Warren 2020 or Warren 2024. At the end of the interview, as Colbert thanked Warren and reminded viewers once again, "Elizabeth Warren, not running for president," you cut to commercial break thinking, "Wait, why not?"